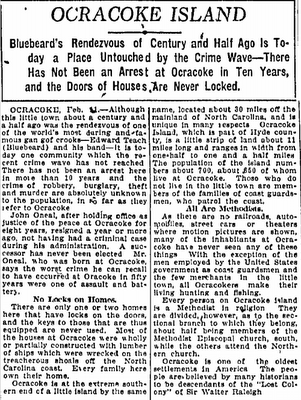 Each day this week, I'll be featuring a news article - a highlight of Ocracoke's history throughout the years..
You've heard me describe Ocracoke - the small barrier island which holds a dear place in my heart. The place seemingly untouched by much of today's hectic life. Its a place where it seems that time has stood still - well, for as much as it CAN stand still. 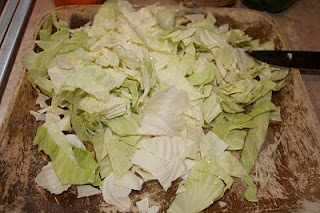 And, while I sit & type and marvel about this... I'm not alone, nor anywhere near the first to have these thoughts. 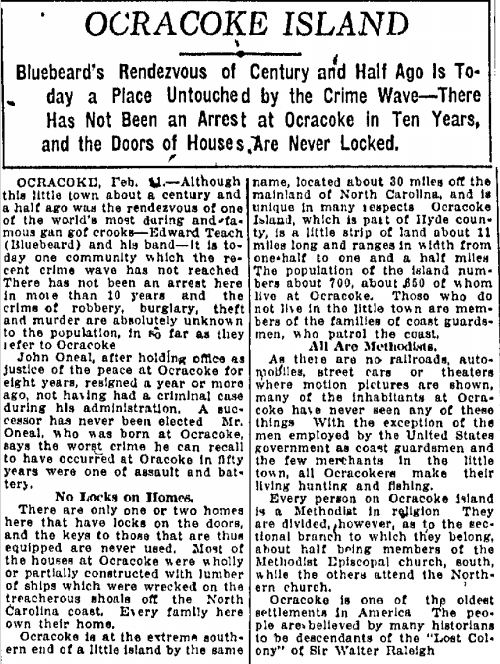 Nearly 90 years ago, this news article described Ocracoke much as we would today. There is a touch of legend (AYE, Blackbeard! ), a touch of disbelief (of doors without locks! ), a touch of history (homes built from the lumber of wrecks!) and a touch of community- which is still a small group of folks who are lucky enough to call Ocracoke home.